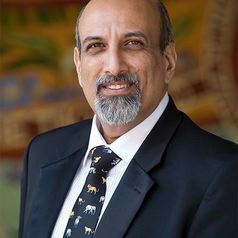 Professor Salim S Abdool Karim, MBChB, PhD, DSc (honoris causa) is a South African clinical infectious diseases epidemiologist who is widely recognised for his ground-breaking scientific contributions in HIV prevention and treatment. He is Director of the Centre for the AIDS Program of Research in South Africa (CAPRISA). He is also Professor of Clinical Epidemiology at the Mailman School of Public Health at Columbia University, Adjunct Professor of Medicine at Weill Medical College of Cornell University and Associate Member of The Ragon Institute of Massachusetts General Hospital (MGH), Massachusetts Institute of Technology (MIT) and Harvard University. His contributions to microbicides for HIV prevention spans two decades and culminated in the CAPRISA 004 tenofovir gel trial which provided proof-of-concept that antiretroviral drugs can prevent sexually transmitted HIV infection and herpes simplex virus type 2 in women. He is co-inventor on patents which have been used in several HIV vaccine candidates and his clinical research on TB-HIV treatment has shaped international guidelines on the clinical management of co-infected patients. He is Chair of the UNAIDS Scientific Expert Panel and is a member of both the WHO HIV-TB Task Force and the WHO Expert Panel on Sexually Transmitted Infections and HIV. He is an elected Fellow of the World Academy of Sciences, the African Academy of Sciences, the Academy of Science in South Africa, the Royal Society of South Africa and the American Academy of Microbiology. He is a Foreign Associate Member of the US National Academy of Medicine. He serves on the Boards of Lancet-Global Health, Lancet-HIV and the New England Journal of Medicine.